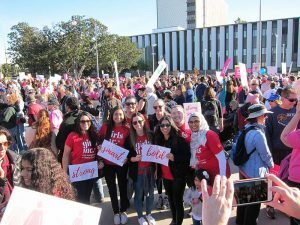 A large group of Girls Inc. Orange County members came out to participate and let their voices be heard at the second annual Women’s March, which was held in Santa Ana on Jan. 20. Around the country, the Women’s March served as an opportunity to come together with other women to stand up for women’s rights, equality and in opposition to sexual harassment. 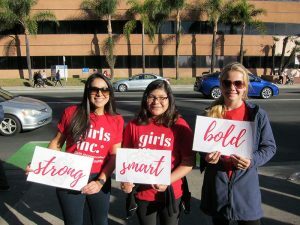 Along with thousands of other marchers, members of Girls Inc.-OC showed up bright and early, united in a cause which is in line with the Girls Inc. mission. Each girl and woman present that day had a unique perspective on the march and a different motivation that brought them to the event. Many women were angered by our own president’s actions and attitudes towards women. They utilized this march as an opportunity to demonstrate with pride and even held signs of protest. “I think for me the march is a symbol of empowering girls to understand that they have access to equal education, equal pay, and the right to be free of sexual assault and the right to speak up against these things that happen in our society,” Claudia Del Valle, mother of Julianna Del Valle, said. With many cases of high profile sexual harassment in the news, fighting for women’s rights is now more important than ever. To stress the significance of women’s rights, former Girls Inc. staff member Noreen Rahman brought her husband and two young children to the march on Saturday. “I think it’s important for our kids to see that women’s rights are important–they are human rights, and equality is something that I want them to be able to strive for and hopefully we will get there by the time they’re older,” Rahman said. The march was a perfect opportunity for girls to band together and prove themselves to be strong, smart, and bold–the mission that Girls Inc. strives towards. Girls Inc. has empowered so many young women, including myself, to increase their self-confidence and become future leaders. “Being there for 11 years, I really believe in the mission of Girls Inc. to inspire girls to be strong, smart, and bold,” Rahman said.